12 3/4 in. (32.4 cm.) diam. Previously sold in these Rooms, The Imperial Sale, 30 April 2000, lot 576. It is rare to find examples of early Ming dynasty cloisonné wares of such massive size. The most well-known published example is the Xuande mark and period jar and cover illustrated by H. Brinker and A. Lutz, Chinese Cloisonne from the Pierre Uldry Collection, Zurich, 1989, pl. 5. A closely related, but smaller, censer with a Jingtai mark, raised on similar three-clawed feet, enamelled with figures in landscape, is in the Musée des Arts Decoratifs, Paris, and illustrated in Transactions of the Oriental Ceramic Society, vol. 30, London, 1958, no. 317. The scrolling lotus pattern of undulating veins encircling each formalised lotus bloom, appears on a number of early 15th century cloisonné vessels. 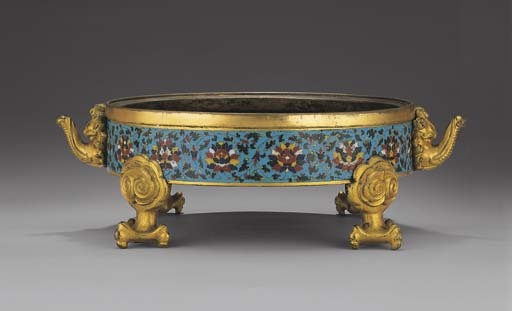 Compare the similar floral treatment on a censer with phoenix handles and cabriole legs, from the Musée des Arts Decoratifs, illustrated by H. Garner, Chinese and Japanese Cloisonné Enamels, London, no. 15. Other examples include a tripod censer in the Pierre Uldry Collection, illustrated op. cit., pl. 13; a vase with lotus scrolls enamelled on the globular body, illustrated in Chinese Art: The Minor Arts, Tokyo, 1964, no. 73; and a bowl sold in these Rooms, 2 November 1999, lot 798. The inspiration of the Indian lotus bloom is probably a direct influence from ceramic production at the Imperial kilns at Jingdezhen where underglaze-blue floral patterns in formal bands of this type continued from the Yuan dynasty into the Ming, proving to be one of the most popular motifs in the 15th century.